Wix vs WordPress - Which Is Better Option For Your Website? WordPress and Wix both are the most popular website builder nowadays. The question is, which platform we should use for building a great website WordPress or Wix. Both may have some advantage and disadvantage. What is the main difference between Wix & WordPress? Which Is Better? WordPress is an open source CMS software so you need to upload it on your web server then you can use it, on the other hand, if you want to use Wix to build your website you have to go their website wix.com and sign up for an account and you can start building your site. Beginner’s first choice can be Wix because you don’t need any coding knowledge to use Wix for building a website. Wix has Drag & Drop Feature so you can easily use that. You can also use WordPress if you have no coding knowledge but in some cases, some coding skills are required to get desired output. Wix has a really powerful drag & drop tool for building a website. You can select any element like image, text, video, content and rearrange on your desired position. you can edit with WYSIWYG interface. Wix is a time-saving platform free those don’t have any coding skills. WordPress comes with a visual editor where you can write edit or modify your content, add images, videos, audio. You can also use theme customizer to customize your theme and you may also found drag & drop feature in the theme customizer. Everyone wants to build a great looking website for which site builder gives the best design & layout for website. Wix comes with more than 500+ pre-built modern & great looking templates. Wix uses HTML 5 for design their templates, So you can easily customize the template that fits your need. You can also choose pre-build templates from many categories like Business, Online store, Videos, Blog & forms, Travel and many more. You can easily customize your site with a wide range of free and premium theme. free themes have limited option for customization but many of them give a great look of your site. You can download free themes from WordPress.org. For the premium theme, there are many theme shops. like A WP life, Themify, StudioPress. If you want something more than provided in theme, you can also use ad-ons or plugins available for WordPress website. These plugins like a Gallery, Portfolio, Forms, Blog Filters etc. can add extra features to your website with ease. Tons for plugins already added on WordPress.org and it keeps increasing daily. Just think about any feature or plugin for your website, whether it’s related with security of your website or it’s for speed, you can find almost everything. Blog features is one of the most important features for any website. It helps you to stay connected with your visitors through blog posts. Blog also help you to get traffic for your website and provide valuable information to your website visitor. Choosing the right blogging platform is really important. Blogging platform should provide ease of access, create and post content. So what should you use for blogging Wix or WordPress? Wix has a blogging feature that allows creating blog add categories, tag, archive, video, audio. Wix is a quick and easy platform to start blogging but Wix has a lack with the comments system. Wix doesn’t provide any comment system for visitors, it uses Facebook comments instead. WordPress is a great CMS for blogging. It is fast, flexible and really easy to use and there are more options for blogging which are missing in Wix. It comes with the latest Gutenberg block editor which allows you to create beautiful layouts for your posts easily. WordPress powers more than 33% of all websites in the world and it has more features than Wix, specifically when we are talking about Blog. So here we can say WordPress wins clearly in the blogging section. Pricing completely depends on your needs. Wix and WordPress both have free as well as paid options. You can opt in for paid versions according to your requirement or can go with free. Prices varies according to various factors like storage, bandwidth, website designs, security etc. Wix is available for free as long as you want but if you need the extra feature or you want to make your site more professional then they have six premium plans. There are different types of plans available for both Wix regular site and Wix eCommerce stores. WordPress is an open source CMS, and it is available for free for anyone to use. But you need spend small amount for a domain name and hosting to install it. WordPress has a wide range of free and premium themes & plugins. After getting domain & hosting, you can play around with tons of free themes and plugins available on WordPress.org. It gives you full freedom for customization but you may need to hire a developer or you must have some coding skills for it. 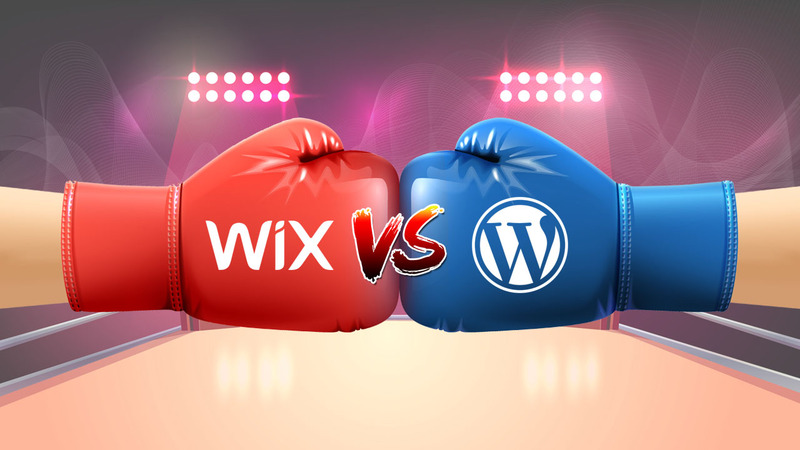 WordPress or Wix? There is no perfect answer to this question. Out of Wix and WordPress which one is better, it completely depends on what you’re looking for, a website builder? or something which fits your skill level. If you’re pretty confident about your technical skills which can be used to build a large site, WordPress might be a good choice for you. However, if you’re not so tech savvy and looking for easier platform which can help you build beautiful websites in no time, Wix is for you.